Yash Gupta is dean and professor at the Johns Hopkins Carey Business School in Baltimore, Md. He previously served as dean of the business schools of the University of Southern California, the University of Washington, and the University of Colorado at Denver. Dean Gupta’s academic and administrative appointments have also included the Frazier Family Professor in the School of Business at the University of Louisville (1988-1992), professor at the University of Manitoba, and assistant professor at Memorial University of Newfoundland. In 1991, he was awarded the University of Louisville President’s Award for Outstanding Scholarship, Research and Creative Activity, and in 1994 and 1996 he was ranked as the most prolific scholar in the area of operations management in the United States. He currently serves on the governing board of the Association to Advance Collegiate Schools of Business (AACSB). Dean Gupta earned a Ph.D. in management sciences from the University of Bradford, England, in 1976. He also holds a M.Tech, production management, from Brunel University of West London, England; a B.Sc.Eng, production engineering, from Panjab University, India; and a P.Eng. from the Association of Professional Engineers of the Province of Manitoba, Canada. In addition, he completed the College Management Program in the Heinz School of Public Affairs at Carnegie Mellon University. Rahul- While institution building is a time-intensive process, you have managed to create significant visibility for the Carey Business School since its establishment in 2007. What do you assess as the most critical success factors? 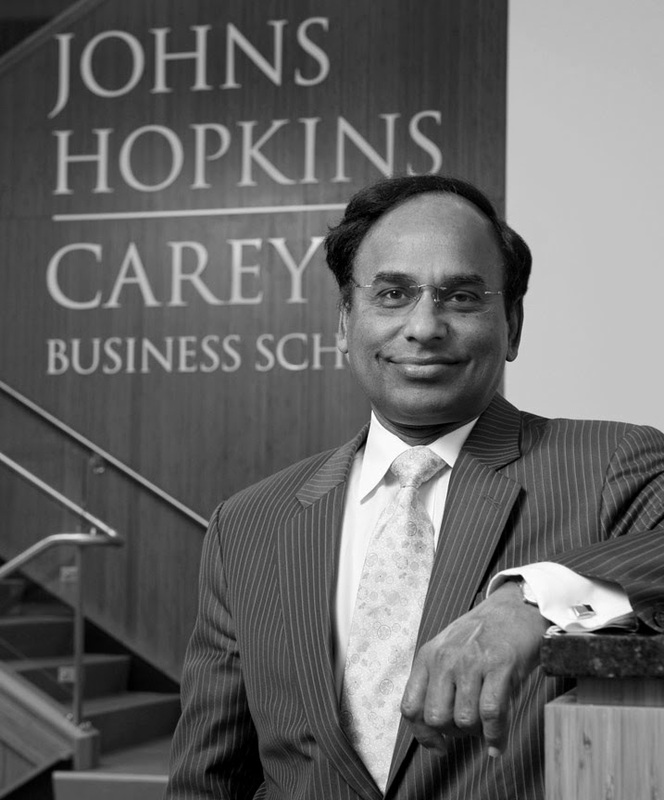 Dean Gupta- First, our connection with Johns Hopkins University has helped draw attention to the Carey Business School and its mission. But we couldn’t just sit back and let the JHU brand carry us to success. We also had to design a unique approach to business education, one that emphasizes intellectual flexibility, empathy, global awareness, and the practical application of classroom knowledge to real-world problems, as evidenced by our Innovation for Humanity (I4H) and Discovery to Market (D2M) projects. Our timing also happened to be good – or lucky, depending on how you look at it. We launched the school just before the worldwide economic meltdown, and that actually proved to be a blessing in disguise for us. Suddenly people were questioning the traditional ways of doing and teaching business, and this opened the door to more serious consideration of the approach we were taking at Carey. Meantime, we have been building two important boards at the school — our Board of Overseers and our Corporate Advisory Board, both consisting of leading business executives from around the globe. Their presence has helped provide credibility. They believe strongly in what we’re doing here and have spread the word about our mission and our programs. Among the other success factors: We have constantly sought, and attracted, top-tier faculty and students. These are people who could have cast their lots with more established business schools but decided they wanted to be part of something revolutionary and exciting. Also, we have staged many public events, such as our Leaders + Legends lecture series, which brings CEOs and top administrators from the private and public sectors to our campus every month. And we’ve aggressively marketed the school and earned extensive media coverage. In the past couple years, many print and video pieces about us have appeared in The New York Times, Washington Post, Financial Times, Wall Street Journal, Chronicle of Higher Education, Forbes, Fortune, Bloomberg TV, C-SPAN, PBS, and other well-known outlets. Rahul- The Global MBA program has weaved its curriculum around real-world applications and has some unique elements like the Innovation for Humanity Project. Please share your assessment of the program and student experiences thus far. Dean Gupta- Business schools have a lot to learn from other disciplines. Take the study of medicine. Theory is crucial, but so is practice. What would a doctor’s education be without the clinical work? In the study of business, relatively little has been done along those lines. Perhaps a few classroom projects aim to replicate this approach, but you don’t often see formal plans that weave theory with practice. The Carey Business School changes this approach through Innovation for Humanity and Discovery to Market, both of which apply business theory to practical, real-world situations. This could include helping a health clinic in Africa devise a strong business plan, as in our I4H project, or taking an invention made at Johns Hopkins and turning it into a commercially viable product or process, as in D2M. In addition, we have our Thought and Discourse seminar series, based on a liberal-arts ethos. Every week, the students engage in Oxford-style debates about questions related to areas such as ethical conflicts, human expression, statesmanship, and power and politics. These courses embody the philosophy of our school, which is to teach “business with humanity in mind.” We look at business through a problem-solving lens. We convey to our students the idea that we live in a world of relentless change and ambiguity. Within the past decade, look at the changes brought about by advances in technology, and by the development of Google, Facebook, and Twitter. How many people saw these changes coming? And who knows what the next five or 10 years will bring? We need, then, to prepare business students who can be adaptable in this world of rapid change and ambiguity. It’s not simply about being able to reduce ambiguity but also to understand and even thrive in it. The I4H Project, in particular, represents this concept. As we place our students in places such as Rwanda and Peru and India, we help them grasp that the future of today’s organizations is not going to depend exclusively on the United States and other developed nations. The customers of the future will be found in Africa and Asia and Latin America, so it’s important to start building the knowledge and the empathy that will enable our students to succeed as business people in places and cultures that once might have been very foreign to them. We want Carey students to know what it’s like to walk in the shoes, in the skin, of people in distant environments. Rahul- What are your strategic priorities for next three years for the School? What role will educational partnerships with other institutions play in offering joint-degrees or exchange programs? Dean Gupta- A leading priority is to continue attracting outstanding people; we won’t stop recruiting the best faculty and the best students available throughout the world. We will be looking to build significant international partnerships with other schools, possibly by exchanging faculty and students for short periods and developing joint academic programs. Already, during our Innovation for Humanity Project in January of this year, we worked in concert with other universities in Peru, Kenya, Rwanda, and India. We have seen how successful and beneficial those arrangements can be, and so we want to build on that. In terms of programs, we’re launching our new Executive MBA program this year. It will be a distinctive kind of EMBA because it will include the I4H and D2M pieces from our Global MBA. Another near-term goal is to launch a non-traditional business PhD program, perhaps to be run jointly with other divisions of JHU. Certainly we’re not content to rest on the accomplishments of our first few years. We intend to keep growing toward our goal of being one of the best business schools in the world, and one of the best for the world. A very insightful and useful interview. I am a small business owner and keen on a MBA. I wish to take my business into other countries and doing a global MBA would add to my knowledge base. My area of interest is solar energy and how to exploit this abundant resource and help people around the world to be weaned off oil and gas. Hey hi…i just go through your article it's really god one.Thank you for the information.